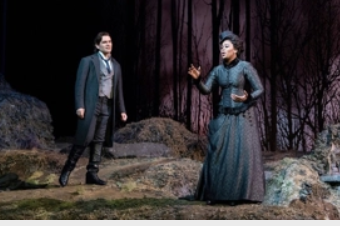 Dear Readers, allow me to introduce guest reviewer Chris Grimm who has some interesting things to say about the Metropolitan Opera's production of Lucia di Lammermoor. Mr. Grimm is a former publishing executive who now manages a restaurant in Connecticut. A former contributing editor to the James Beard Award-winning Oregon Wine Report, Chris attends opera in New York and throughout the northeast. He also follows electronic dance music. He is a regular Met-goer which we are not, and will be able to cover that "beat" for us. Wednesday night’s performance was the first for the final cast of the Met’s revival of Lucia di Lammermoor, featuring Pretty Yende in the title role and Michael Fabiano as Edgardo. While compare-and-contrast reviews aren’t ideal, Mary Zimmerman’s 2007 production is a known quantity - traditional, set in 18th Century Scotland, with a Met-audience-friendly (if overly dark-hued) feel, so the performances are the more obvious subjects for scrutiny. With a similarly prominent first cast (featuring Olga Peretyatko-Mariotti and Vittorio Grigolo), they do beg to be compared. Pretty Yende, who surely can have the word “rising” removed from any description of her as a rising star, has a wonderful instrument. Her Elvira, last season, substituting for Diana Damrau in one performance of I Puritani, was the definition of a star-making performance. She continues to shine as a coloratura specialist, hitting high notes with remarkable agility. If there was the slightest downside to her performance, it was in occasional (if minor) difficulties projecting over the Met orchestra – but given the spotlight (obviously, the mad scene) she thrilled the audience. While I had not found Peretyatko-Mariotti’s performance to be as bad as some of her critics said, I do think, by comparison, it was pedestrian. Michael Fabiano was a stellar Edgardo – and one that especially begged for comparison with Grigolo’s, earlier in the season. Vittorio Grigolo is certainly an audience favorite at the Met – he’s charismatic, can fill the house with sound, and brings irrepressible energy to every performance. Unfortunately, during the April 5 performance that I attended, when the action became most frenetic, his singing would lose it’s focus on notes, becoming something more like excited shouting. Grigolo is undoubtedly a great talent – but sometimes his performances are great despite his singing, rather than because of it. On the other hand, Fabiano’s voice was absolutely glorious – he never lost focus, his notes were beautiful. What surprised me Wednesday night was the realization, for the first time, as to how big Fabiano could make his voice – seeming more heroic than lyric, without sounding forced. His acting is not quite as good as Grigolo’s – his default emotion seems to be anguish – but taken as a whole, this was superb work.